Terra Neuf, en de Custen van Nieu Vranckryck, Nieu Engeland, Nieu Nederland, Nieu Andalusia, Guiana en Venezuela - Renard, L.
Title : Terra Neuf, en de Custen van Nieu Vranckryck, Nieu Engeland, Nieu Nederland, Nieu Andalusia, Guiana en Venezuela. Map maker : Renard, L.. Size : 19.1 x 22.4 inches. / 48.5 x 57.0 cm. 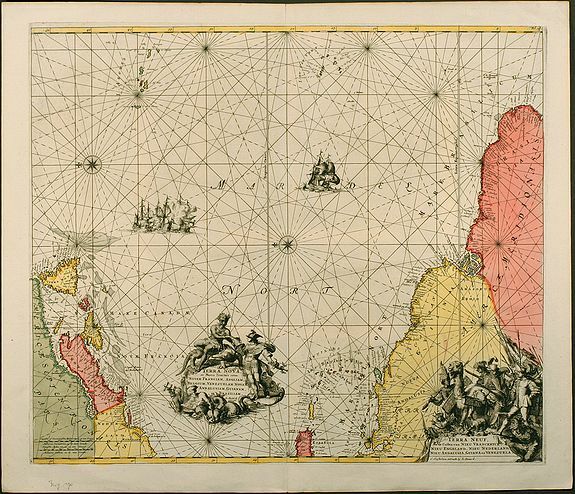 Description :L. Renard's edition of Frederick de Wit's magnificent Atlantic chart oriented to the East. From the 1715 edition of "Atlas de la Navigation et du Commerce". A fascinating and very decorative early sea-chart of the western Atlantic, showing the coasts of New England, New Andalucia, New France, Guiana and Venezuela. Also the Caribbean Islands from Trinidad to Hispaniola and the Atlantic up to the Azores and Cape Verde Islands. With beautiful cartouches and dramatic battle scenes. Original old hand coloured. Condition : Two small tears in centerfold margin backed. Excellent condition.